Alex writes: John R very kindly gave me a lift from Cambridge to Maningtree for the start of this audax. It was to be his first 300km ride and my second. With good weather in prospect we were both looking forward to an experience that we hoped would be both pleasurable and challenging. 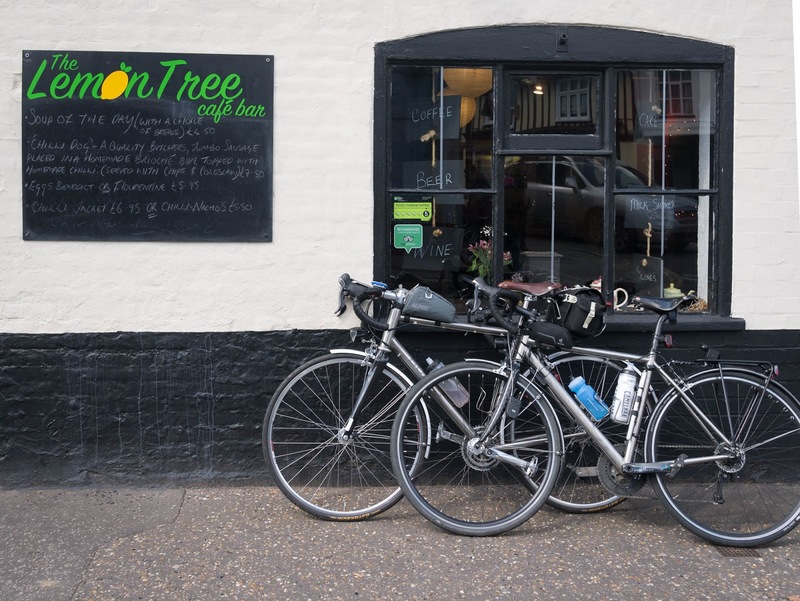 The basic idea of this event, the Green and Yellow Fields, is to ride through the night to breakfast (on the North Norfolk coast) and then ride back, all within 20 hours. The ride would begin at one minute past midnight, and John and I had booked into the pre-ride curry beforehand for a chance to fuel ourselves and get some tips from more experienced riders. 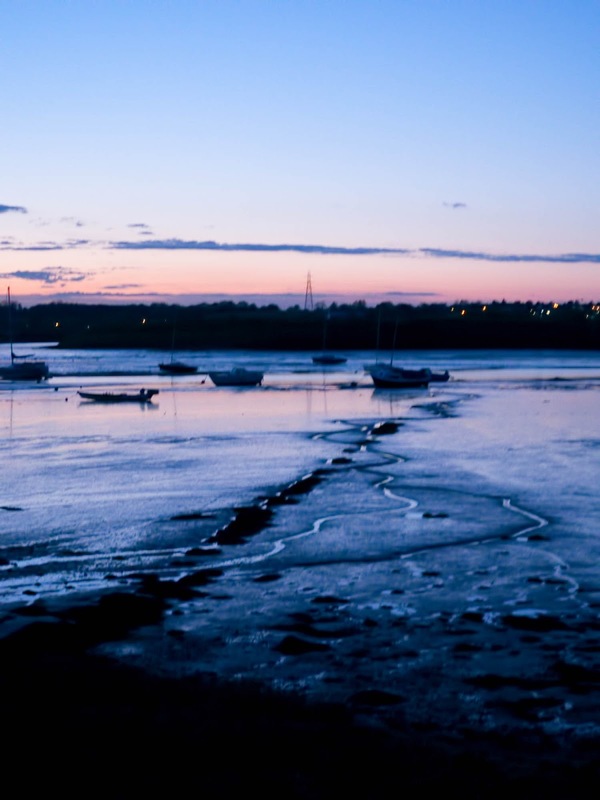 Night was just falling as we arrived in Manningtree and it was already so cold I started shivering on the short walk to the curry house. As usual I over-ordered curry, and today chose chicken jalferezi, pilau rice, sag aloo, and a peshwari naan. It was extremely good and really quite spicy, but I couldn't quite finish it all and settled back feeling stuffed to the gunwales. Was this a good way to start a long ride? I was still feeling full as we made our way to the départ at Maningtree station. There we were pleasantly surprised to meet John S who was riding too, fresh from his conquest of Ventoux. After the usual low key instructions ("... all right, off you go") we were underway in a field of around 50 riders. Unusually, this event has a maximum permitted speed of 25km/h, so there is no point in anybody riding very fast, as they would arrive at the controls before they "opened" and have to wait around. This speed restriction has the beneficial effect of keeping all riders together for the first hours of the ride, and indeed we soon found a group riding at our pace and rode á peloton for the first 75km leg up to Barton Mills services. 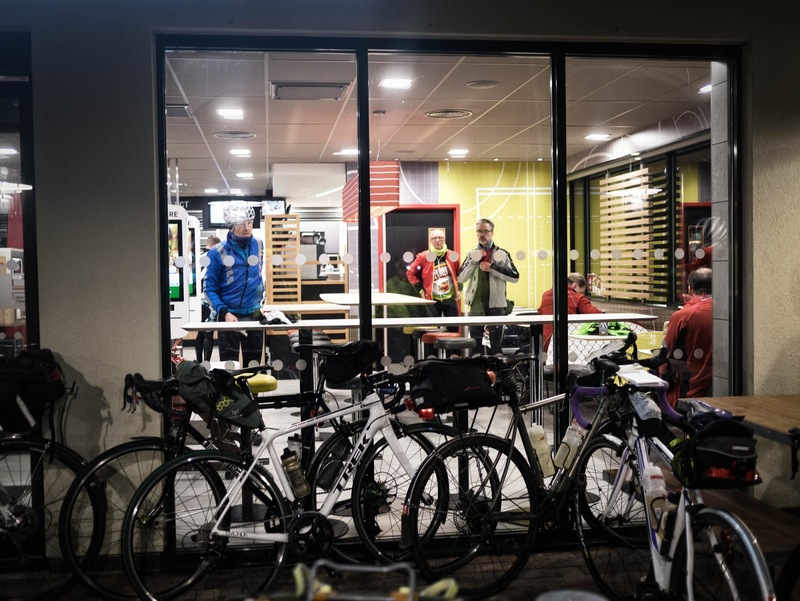 Normally the opening of a 24-hour McDonald's is not a noteworthy event, but the new one at Barton Mills has caused excitement in the audax community as it will make a number of night-time events in this part of the world much more pleasant. A few of the more grizzled riders were complaining about this new soft option and reminiscing about having to negotiate with a grumpy till assistant through a garage shops's service hatch – but most of us were glad to see the golden arches and get into the warmth for some hot food – especially since the temperature was now below freezing. After (surprisingly good) coffee and a donut I was ready to face what I knew would be a hard leg of the ride: another 75km up to breakfast at Burnham Deepdale. To help, I activated a small electrical device on my bike which I hoped would aid progress: a bluetooth speaker which could play music from my phone. I fired up my souplesse-boosting selection of 1979-ish disco-ish tracks and the Bee Gee's Tragedy rang out into the night (appropriately enough for audaxing " ... when the feeling's gone and you can't go on ..."). This quickly attracted the attention of the crew of a tandem trike: Mark and Jane, who wanted to ride with us. 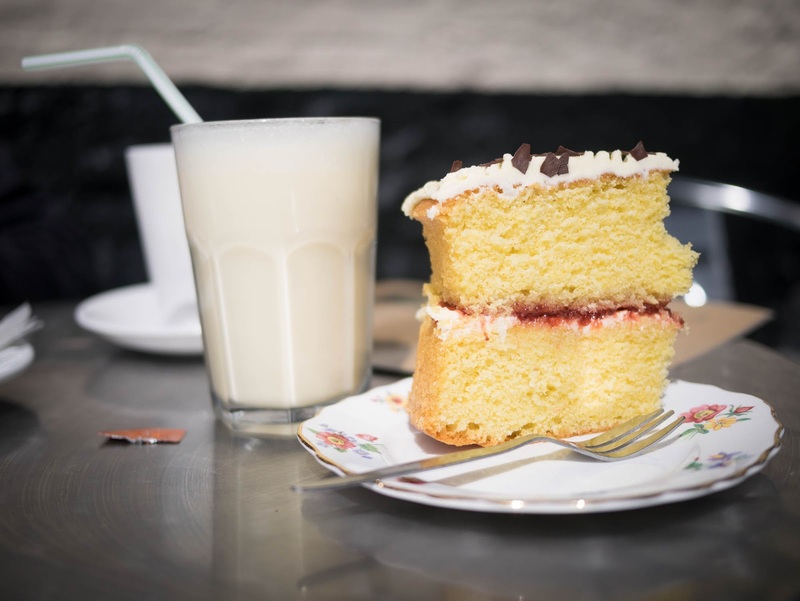 This turned out to be a good deal because they – very experienced riders – had a superbly consistent pace, a machine that provided a draft like a tractor beam, and a cake box with some delicious home-made ginger cake that they generously shared. It was great to ride with them and this made the journey through the night a highlight of the ride. As we zoomed up the A1065 (a road best avoided during the day) the temperature kept falling to reach a low of -6°C, and occasional wisps of icy mist drifted across the road; I was glad I was wearing full winter clothing. But soon the sky started lightening and we experienced a full technicolor dawn into a clear sky. On quiet lanes now as the sun rose, we passed a number of beautiful scenes – brooks shrouded in mist, warm light on churches, infinities of green shades on grassy hills - which made me regret I couldn't linger to take photographs. We passed the occasional cyclist stopped in a spot of sunlight to try and thaw out but we weren't stopping: breakfast called and we were going strongly. At 07:45 we arrived at Burnham Deepdale; half-way. Over coffee and scrambled eggs I said to John R that we could now forget the night, and say we just had a nice 150km day ride ahead of us on a sunny day with a couple of stops – easy! And so it proved – the major challenge of the next leg being to cope with the rising temperature. 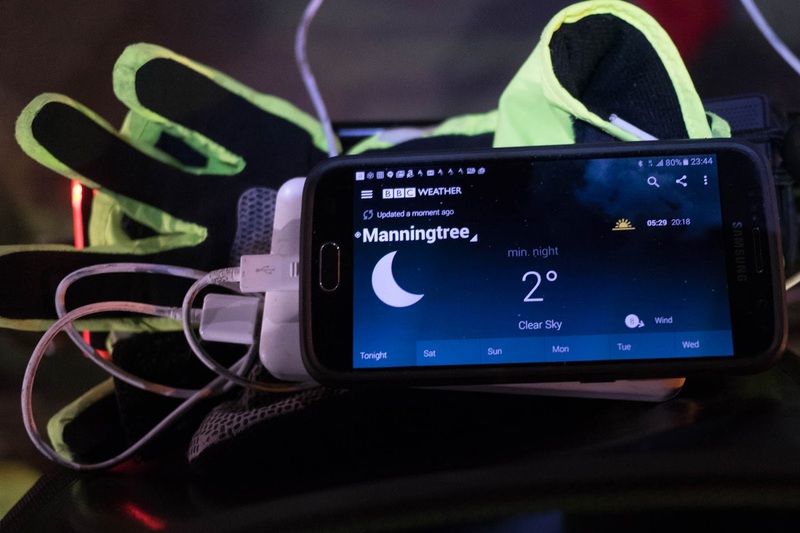 From the full winter garb of the night I had transitioned – by the time we reached Wymondham – into riding gloveless in a short-sleeved jersey. At Wymondham (214 km done) I chose a cake and milkshake and remarked to John R that this was nearly the perfect audax. We just needed some rain to give us a fuller variety of experience. Such jocularity did not go unpunished. Over the next leg the temperature dropped, the wind picked up, and it was clear that in the "big sky" around us a number of showers were on the prowl across the plains. We were hunted-down by one mid-way on the leg to Needham Market and experienced several unpleasant minutes of driving hail. That will teach me! Needham Market came and went (with more cake) and we were soon on the final stretch. The course designer had thrown in a few sharp ramps just at the end to give the legs a final test, but John and I were in such a good mood we found them amusing rather than annoying. 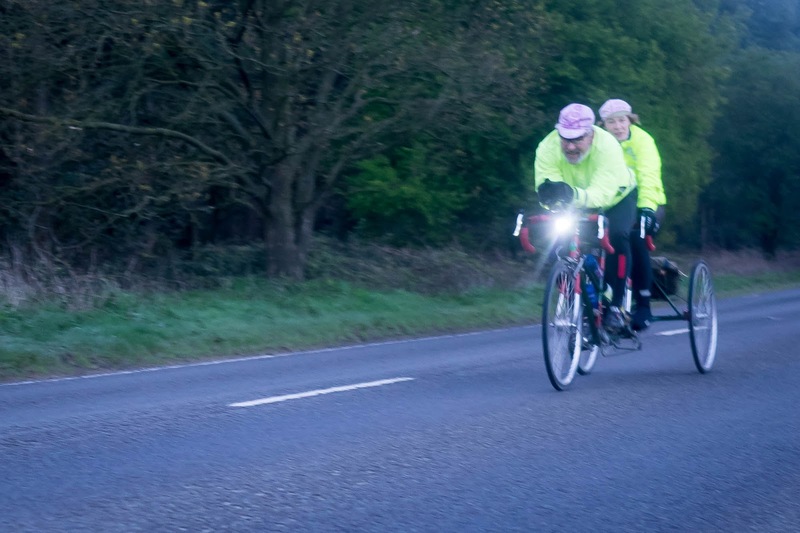 We rolled into Manningtree feeling fresh: we had completed the 300km (186 mile) course in 16 hours 50 minutes. Despite not feeling too tired, when I got home I sat on the sofa for a moment and the next thing I knew I was being woken up and told to stop snoring. And is a big curry a good prelude to a long cycle ride? The answer, it would seem, is yes! Good report, pics & video! Well done all. Very nicely written thanks - I was on the ride too and you caught the spirit of the ride really well.